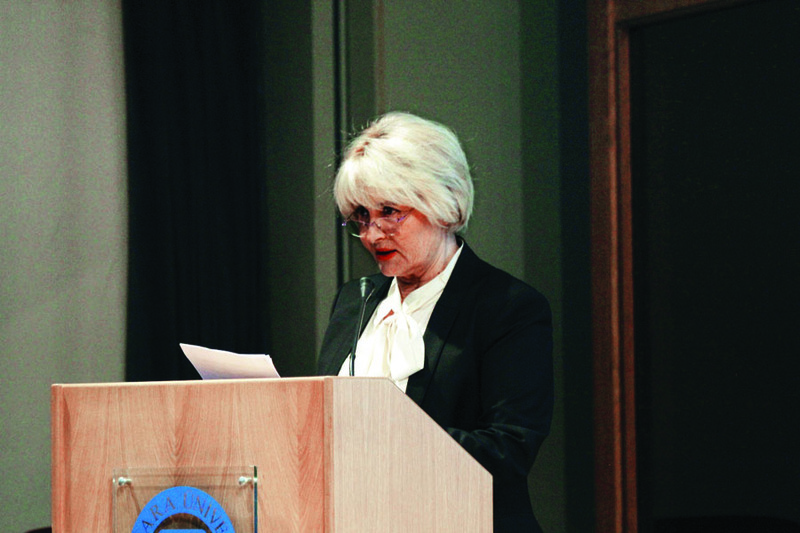 'Turkish from the Past to the Future' Subject was Discussed in the 1st Turkish Language and Literature Conference. Within the scope of 'to search our cultural values, customs, traditions and spiritual values that raised us in our culture, and our Turkish language, support, protect, keep alive and promote researches', which is one of the main purposes of the Elginkan Foundation, various activities have been organized until today regarding Turkish language, literature, Turkish culture in short. Moreover, reference books regarding these subjects have been published, young researchers and scientists in those areas have been supported by giving scholarships and awarding them. Providing financial support to meetings organized regarding the Turkish culture by various institutions, corporations and universities, our Foundation decided to organize Turkish Language and Literature Conference biennially starting from 2013. The conference, which was organized in Marmara University Sultanahmet Campus Prof. Dr. Nihat Sayar Conference Hall, was participated by the leading names of our world of culture and literature and Chairman of the Elginkan Foundation Gaye Akçen, Manager of the Elginkan Foundation İlhan Üttü and members of the Elginkan Community. Changes and developments faced by Turkish language throughout the period starting from its oldest times and extending until today, and predictions regarding the future were made in the conference, subject of which was determined as 'Turkish from the Past to the Future'. In the conference, which was organized in eight sessions for three days, various subjects such as problem of today's Turkish language, language structure, Turkish education, formation of Turkish terms in science and art branches and exemplary pronunciation of Turkish were discussed, 28 reports were presented and 2 open sessions were organized. Conference started in April 17 2013 with the open session 'Turkish in Language of Art'. Changes, which we have experienced but haven't been able to notice in the recent past regarding the language used radios and televisions, which are a more widespread mass media, were expressed and evaluated. Changes occurring in daily language, and threats, dangers towards our language and solution methods were discussed in the sessions which started in the same day. It was expressed by participators that the language, which is a living being, were subjected to change within time and this was a natural and inevitable process. Various reports regarding the structure of Turkish and grammar were presented in sessions in the second day. Reports presented regarding Turkish education, including speaking Turkish, pronunciation and teaching Turkish to foreigners were discussed in the last day. It was expressed during speeches given for three days in the conference that some negativities we are having in Turkish language can be eliminated through effective works to be carried out in time. It was emphasized that Turkish broadcasting is made to various parts of the world through satellite broadcasts, television and radios, and number of people speaking Turkish increases. Moreover it was stated that Turkish schools are opened in the four corners of the world and not only dissemination of Turkish language but also promotion and extensification of the Turkish culture is ensured. Conference ended with vote of thanks of the Elginkan Foundation Manager İlhan Üttü. In his speech, İlhan Üttü expressed his targets regarding organization of the second Elginkan Foundation Turkish Language and Literature Conference at international level and in a more comprehensive form in 2015. Our deceased Chairman always put the importance of Turkish in the first place. 'One of the legacies left by our Constant Chairman of the Elginkan Community Deceased Hüseyin Ekrem Elginkan was 'to search our cultural values, customs, traditions and spiritual values that raised us in our culture, and our Turkish language, support, protect, keep alive and promote researches'. Our Founder and Constant Chairman had aimed to protect, keep alive and support the cultural heritage and values of Turkey with care at one side, and open educational institutions that would enable training of qualified manpower and expand it throughout the country on the other side. Along with being an engineer, Founder of our Foundation Hüseyin Ekrem Elginkan was also a leader who attached a great deal of importance to Turkish and rhetoric. I spent the last 15 years of my deceased elder with him. While he was watching TV in the evening, he sometimes got disturbed from the Turkish used and said: 'This is not my Turkish'. One of its most important legacies to me was the Elginkan Foundation's conducting studies regarding our Turkish and supporting studies carried out in this subject. He even said 'Let's give prizes as Foundation to studies performed regarding Turkish like Nobel Prize'. It was evaluated with open session. 'Turkish from the Past to the Future' open session was organized at the end of the conference. In the open session, in which a general evaluation of the conference was made, development process from Bengü Taşlar (Orkhon Inscriptions),which are the oldest known written texts of Turkish, until today was emphasized.